The Cuban government released at least three political prisoners in a move widely viewed as a ploy to smooth strained relations with the European Union. We really don't give any credit to the Cuban Government for releasing them, since they never should have been jailed to begin with, and we hope that they can return to their work to build a truly just and open Cuban society. President Bush will have to fight many opponents of immigration reform from his own party in the House of Representatives if he is to accomplish his proposals for a guest worker program. Rep. Luis Gutierrez, D-Ill., used the weekly Hispanic radio address Saturday to challenge President Bush's claim to seek immigration reform. Machismo is not Latino men subjugating women by cheating on them, verbally abusing or hitting. Real machismo is a man's valor, his respect for his family, his willingness to be a provider and a care-taker. Machismo has nothing to do with dominance. Nearly a month after the presidential election, the percentage of the Hispanic vote going for each of the candidates continues to be debated. Everyone is trying to identify trends, but I doubt that much can be made of the results we are aware of at this point. So why is Bush taking on the thankless issue of immigration? I believe it is because he sees the consequences for all Americans of our current dysfunctional policy. These days, it's not always easy to talk about the benefits of immigration. Especially since 9/11, many Americans worry about borders and security. These are legitimate concerns. But surely a nation as great as America has the wit and resources to distinguish between those who come here to destroy the American Dream--and the many millions more who come to live it. No one keeps track of exactly how many American children were left behind by the record 186,000 noncitizens expelled from the United States last year, or the 887,000 others required to make a "voluntary departure." But immigration experts say there are tens of thousands of children every year who lose a parent to deportation. As the debate over immigration policy heats up, such broken families are troubling people on all sides, and challenging schools and mental health clinics in immigrant neighborhoods. An unpublished U.S. Census Bureau report shows the nation's legal and illegal immigrant population is at an all time high of 34 million. The immigrant population increased by 4.3 million since 2000, indicating immigration does not rise and fall in step with the economy, as some have believed, the Census Bureau said Tuesday. Juan G. Tornoe has an interesting post on his blog dealing with a study of Hispanic religious and political affiliations. It's worth a look. BusinessWeek examined real election returns from 62 jurisdictions in 13 states -- mostly places where Hispanics made up 75% to 95% of the population. The bottom line: Bush improved on his 2000 performance in 85% of these heavily Hispanic areas, undercutting Dems' claims that he didn't make inroads. But his gains averaged just three percentage points -- far less than the nine-point gain Republicans have been trumpeting. Given those relatively small gains, it seems unlikely that Bush could have jumped to 44% of the national Hispanic vote. The President polled just 16% in Philadelphia's overwhelmingly Hispanic 7th Ward, and he took just 12% of the vote in Chicago's 22nd Ward, which is 91% Latino. He did better in suburban areas but usually scored in the low 40s. Bush's greatest appeal was to rural Hispanics: He took 50% or more of the vote in several heavily Latino counties in South Texas and averaged 41% in the counties along the U.S.-Mexico border. And he carried a majority of the Hispanic vote in Florida, although his percentage declined in Cuban-American precincts in Little Havana and Hialeah. On the day President Bush tapped Alberto Gonzales to be the next attorney general, Gonzales, the son of Mexican immigrants, came to the White House, faced the press and said: "Just give me a chance to prove myself. That is a common prayer in my community." This prayer is a near-perfect formulation of the GOP's new message to Hispanic-Americans, now the country's largest ethnic group. It mixes Reagan-style rugged individualism (give me a chance to prove myself) with old-school FDR ethnic appeal (the "my community" part). And, unlike so many other prayers, this one evidently works. When he is approved by the Senate, Gonzales will become the highest Mexican-American federal official in memory. Article II of the Constitution directed that in the future only "natural born" citizens would be eligible for the nation's highest office. There may have been reason for suspicion of the foreign-born as the nation was in formation, but that nativist bias has no place in a nation proud of its "golden door." Jason L. Riley of the Wall Street Journal gives some good advice to Republicans: "Ignore the anti-immigrant right." Mr. Bush just met with Mexican President Vicente Fox and told him he is pushing ahead with a guest-worker program. The Republican Congress could do worse than meet Mr. Bush halfway. Immigration reform would go a long way toward solidifying the GOP's majority status. And it's not something that the nation's newest arrivals and their descendents would soon forget. U.S. President George W. Bush said he continues to support changing U.S. immigration laws to let undocumented immigrants work legally in the country, using the final day of an economic summit of Pacific Rim nations to court Latin America allies. The President is also discussing the possibility of expanding free trade between the U.S. and Latin America. The bravery and resolution of Cuba's democrats is inspiring. But, truth be told, they are nowhere near toppling the dictatorship. And the machinery of Raúl's succession is well oiled. While Cuba deserves a Václav Havel or Lech Walesa, it may have to settle for a Deng Xiaoping. That is, post-Fidel Cuba will probably resemble post-Mao China more than post-Soviet Eastern Europe. Democrats cannot count Hispanic voters as part of their base and must actively court them in order to again become the dominant political party in the United States, an organization of Democratic activists said Wednesday. They are right to be discussing what to do because the evidence continues to mount indicating that Hispanics are moving away from the Democratic party. HAVANA (AP) -- Fidel Castro says the emergence of an Osama bin Laden videotape just ahead of the U.S. presidential election seemed to have been "arranged" to help President Bush. In his first public comments about Bush's re-election, the Cuban leader said, "We have seen too much ... trickery and shamelessness to sustain the belief that this wasn't something arranged." Interestingly, Geraldo Rivera told Fox and Friends this morning that John Kerry told him that the Osama tape had scared the American people into voting for President Bush. Make your own conclusions. The National Council of La Raza has released a study (PDF) of the available data on how Latinos voted in the 2004 presidential election. The conclusion seems to be that the President did not garner the widely-reported 44% of the Hispanic vote but a more modest 39% or so. Personally, I don't understand the point of trying to diminish the President's victory. If I were leading an organization that advocates for the interests of Hispanics, I would want the party that controls all branches of government to believe that they owe their power to us. How does it benefit Hispanics to claim that more of us voted for the loser? Chávez survived and now seems poised to get his revenge on the private media with a sweeping law that critics say will throttle Venezuela's overwhelmingly anti-Chávez broadcast media. The Law of Social Responsibility for Television and Radio sets out to protect children from sexual, lewd and violent programming. But opponents say what they call the ''gag law'' would subtly shield Chávez's government by imposing stiff penalties for those who break its sometimes very specific and other times extremely vague restrictions. A record 157,000 illegal immigrants were removed from the U.S. in the past year as authorities stepped up efforts to find those who may pose security risks, the government said. About half of those deported in the year ending Sept. 30 had criminal convictions, an increase of 6.6% from the previous year, and deportations of those who had no criminal record rose more than 10%, Immigration and Customs Enforcement officials said. In fact, what the state-by-state vote estimates really show is that Hispanic voters were likely to cast their ballots in ways similar to the people with whom they live. By and large, Hispanic people voted for the same candidates as their Anglo and African-American neighbors. Hispanic people who live in "red" states were more inclined to back re-election for Bush, while those who live in "blue" states were more likely to vote for Sen. John Kerry, D-Mass. Republicans close to the White House said Thursday that the choice of Alberto Gonzales as attorney general was part of a political strategy to bolster Gonzales' credentials with conservatives and position him for a possible Supreme Court appointment in the future. 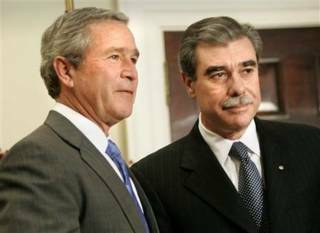 These Republicans said Gonzales had been widely viewed as one of Bush's top choices for the court. I guess it helps that the liberal media don't view him as a "right-wing" nut. Entrepreneurship, family values, patriotism and faith are topics that resonate with many Latino families. Despite federal laws that say that American trade embargoes may not restrict the free flow of information, the Treasury Department's Office of Foreign Assets Control continues to regulate the import of books from Iran, Cuba and other countries. All indications are that the President will face heavy criticism from both sides of the aisle when he finally gets around to doing something to reform our current immigration system. In what appears to be the largest mass defection of Cuban performers to date, 44 dancers, singers and musicians, here to stage a revue, plan to seek political asylum in the United States, troupe members said on Sunday. Most of the artists intend to deliver their applications for asylum personally on Monday morning at the Federal Building here, the performers said in interviews in an auditorium at the Stardust Resort and Casino, where their "Havana Night Club" revue is booked for a three-month run. This was the election when Hispanics came of age. Two were famously elected into the Senate, providing a powerful symbol of their political advent. To Ken Salazar in Colorado, and to my fellow Cuban-American Mel Martinez in Florida, I send congratulations. But to my mind, much more important are the following numbers from pollsters: 72, 62 and 54. These are, respectively, the percentage of Hispanics that voted for Clinton in 1996, Gore in 2000 and Kerry last week. Two more figures, 50% and 40 million, are, respectively, the increase in Hispanic voters in 2004 over 2000, and the number of Hispanics now in the U.S., a country of 280 million. Two more stats are really important (and then I'll stop). The first is that 22% of Hispanics told pollsters they were voting for the first time. Of these, the party split was even. This might be the most ominous number for Democrats, since party loyalties are cemented early. Emilio Garza and Miguel Estrada are still mentioned prominently in a lot of short lists for the next U.S. Supreme Court Justice. 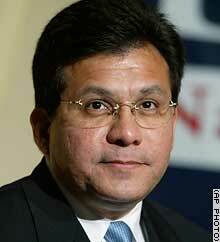 President Bush has appointed Alberto Gonzales to succeed John Ashcroft as U.S. Attorney General. Gonzales becomes the first Hispanic to be named to that position. WASHINGTON -- It is still largely a white men's club, but the new Congress will be the most diverse in history, with more African-Americans, Latinos, and women than the House and Senate have ever had. What? You read right: There are two Latin Americas in the minds of Bush's most conservative foreign policy advisors. Following Tuesday's election, they have the upper hand in Washington. And they tend to see one bloc of Latin American countries as friendly, and the other one as not so friendly. WASHINGTON - White House counsel Alberto Gonzales, a Texan and confidant of President Bush, is suddenly the focus of speculation that he will be Bush's choice to fill a Supreme Court vacancy when it arises. Although there is no immediate opening, Bush's election victory and the illness of Chief Justice William Rehnquist have focused attention on the near certainty of one or more openings in the next four years. And Gonzales, 49, makes everyone's short list of Supreme Court prospects. Mr. Bush could send an early message here if Chief Justice William Rehnquist decides to retire soon due to illness. He could do worse than elevate Antonin Scalia to Chief Justice and nominate Miguel Estrada as an Associate Justice, even as a recess appointment if that becomes necessary. Mr. Estrada is a distinguished lawyer who had the support of enough Democrats to be confirmed for the federal bench but was filibustered by Mr. Daschle. Mr. Bush's voters do not want another David Souter. The last four years have seen a Republican-controlled Senate reject first class presidential judicial nominations—most notoriously that of Miguel Estrada to the United States Court of Appeals for the District of Columbia Circuit. Although nominees like Estrada received strong professional endorsements, cleared the Senate Judiciary Committee, and apparently could have commanded majority votes in the full Senate, two things prevented that from happening. One was recurrent Democrat filibusters (thought by some, including myself, to be unconstitutional), which under Senate rules can only be broken by a supermajority vote of sixty Senators. Second was the timidity of the Senate Republican leadership even to attempt to break the filibusters by wearing out the Democrats, by parliamentary maneuvers, and/or by mounting a constitutional challenge to their obstructionism. Because the judicial appointment stakes during the next four years will be so high, Conservatives can no longer afford either the Democrats’ aggressiveness or the Republicans’ defeatism. Janice Rogers Brown, the first black woman to serve on California's Supreme Court. Her nomination to a federal appeals court has been blocked by Senate Democrats. Miguel Estrada, a native of Honduras whose nomination to an appeals court was also blocked by Democrats. He's a former clerk to Supreme Court Justice Anthony Kennedy. Emilio Miller Garza, judge on the 5th U.S. Circuit Court of Appeals in New Orleans. Bush's father, the first President Bush, considered the Hispanic judge a Supreme Court prospect. Larry Thompson, who was deputy attorney general and the Bush administration's highest-ranking black law-enforcement official until he quit in 2003 to join a think tank, Brookings Institution. He is a longtime friend of Justice Clarence Thomas. I would be happy with any of these choices. WASHINGTON - President Bush appeared to make substantial gains among Latinos nationwide in Tuesday's election, helping him win the popular vote and apparently carry New Mexico, which he narrowly lost in 2000, according to Latino voting experts. In their unprecedented voter registration drives, both parties spent a major portion of their funds seeking to register Latino voters in the Western battleground states of Colorado, New Mexico, Arizona and Nevada, where Latino voters are mostly Democratic but an increasing number are voting Republican, said Adam Segal, director of the Hispanic Voter Project at Johns Hopkins University. Those Western states ended up in Bush's favor. "It is painfully obvious that the Democratic strategy, whatever it was, didn't work," said Roberto Suro of the Washington-based Pew Hispanic Center. One Latino politician, Bronx Borough President Adolfo Carion Jr., said Tuesday night they "ought to be a wake-up call to the Democrats that the Latino vote is much more volatile than the party imagined." Bush political strategist Karl Rove had targeted Hispanic voters from the beginning. GEORGE W. Bush was re-elected on Tuesday because the Hispanic vote, long a Democratic Party preserve, shifted toward the president's side. The USA Today exit poll shows Hispanics, who had voted for Al Gore by 65 percent to 35 percent, supported Kerry by only 55 to 43. Since Hispanics accounted for 12 percent of the vote, their 10-point shift meant a net gain for Bush of 2.4 percent — which is most of the improvement in his popular-vote share. An Arizona ballot initiative aimed at keeping illegal immigrants from voting and receiving some government services passed easily. But Proposition 200, the Arizona Taxpayer and Citizen Protection Act, may never become law. It first must be reviewed by the Civil Rights Division of the U.S. Department of Justice because any new state law affecting voter rights must be scrutinized to make sure it conforms to the Voting Rights Act of 1965. State voters approved the measure 56-44 percent. Update: LatinoPundit reports that the measure had significant Latino support. I truly believe that Tom Daschle's obstructionist tactics against some of the president's minority judicial nominees to the federal bench had a lot to do with his defeat in last night's election. The ghosts of Miguel Estrada and Janice Rogers Brown came back to haunt him. The New York City school system owes foreign language-speaking parents some straight talk about English. To wit: If they want their children to have the best chance of learning America's native tongue, they should avoid enrolling their kids in traditional bilingual classes. There is some conflicting information on the percentage of Hispanic voters who supported each presidential candidate. One poll says that Hispanics preferred Kerry over Bush by a 60-40 margin and another says it is closer to a 68-31 advantage for Kerry. The Hispanic Alliance for Progress Institute, a non-profit advocacy organization, commissioned a poll October 29th -- before the election -- forecasting historic numbers of Hispanic voter support for President Bush. The poll found Hispanic voters split 44% for Kerry and 42% for Bush. I would love to get confirmation of any of these sets of numbers. Feel free to add your two cents. Update: HispanicPundit reports CNN's numbers of 53-42 in Kerry's favor. It looks as though we will have two (2) Hispanic U.S. Senators beginning in January. Ken Salazar won in Colorado and Mel Martinez seems to have taken the open senate seat in Florida. Both President Bush and his Democratic rival, Sen. John Kerry, have proposed changes that could lead to the most sweeping overhaul in 20 years of U.S. immigration policies, but neither has emphasized the often controversial subject. This article goes on to explain the differences in the details of the candidates' proposals. Both parties are out trying to get more Hispanic votes.